As college towns go, it’s been my contention that we have long suffered a dearth of suitable drinking establishments. Well, a couple of weeks ago that situation markedly improved with our new Irish public house, Devere’s. And there’s a lot to like about Devere’s Pub—a back bar fresh from Ireland itself, an library complete with comfortable couches, great local food including bangers and puddings. They even do a study hall, so I can go to a bar at 9 in the morning, have a cup of coffee and read (enter the library and couches). All this got me felling like I wanted to have a cocktail with some Irish whiskey in it. As David Wondrich, author of probably my all-time favorite (and now out of print) cocktail book, Esquire Drinks, points out that the ranks of Irish whiskey cocktails are a little thin, coming up with the Brainstorm and Emerald. He then goes on a couple of hilarious screeds on various dreadful green Chartreuse and green creme de menthe defilings of Irish whiskey in the name of St. Patricks day drinks, as well as on the choice of bitters in the Emerald. In looking into the Emerald, its history seems a bit obscure. I wasn’t able to find it in the Savoy Cocktail Book or Jerry Thomas’s How to Mix Drinks. I was able to find it in a 1954 edition of Ted Saucier’s Bottoms Up and in the 1935 version of the Old Waldorf Astoria Bar Book. So the Emerald likely dates to Prohibition or slightly before. There’s also seems to be another ill-conceived version of it that is made with gin and green curacao. Stir with ice and strain into a chilled cocktail glass. Garnish with a maraschino cherry. This drink draws obvious comparisons with either the Manhattan, which uses rye and Angostura bitters instead (and yes, dear reader, if you make it with bourbon, you’re doing it wrong. 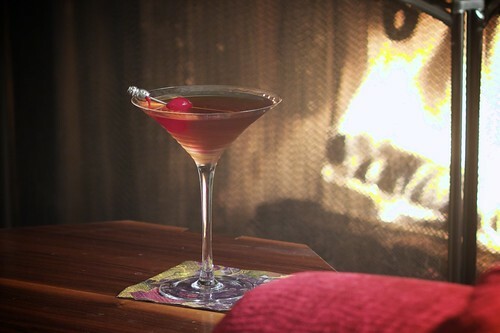 Very, very wrong) or a Rob Roy, which is made with Scotch whisky. This difference in whiskeys really does make for three very different (and all thoroughly enjoyable) cocktails. Irish whiskey, like Scotch, is made from predominantly barley (unlike rye, which is a mixture of rye, corn and wheat). Unlike Scotch, though, it can be made with a mixture of both malted and unmalted grain, and the malting is done over indirect heat, so the resulting mash doesn’t pick up that aggressive peat-smoke flavor. The result is that Irish whiskey tends to be more subtle and mellower that either rye or Scotch, which decidedly comes through in the Emerald. So if you find yourself yerning for the Auld Sod, we’d highly recommend quenching at least your thirst with an Emerald and if you’re near Davis, a visit to Devere’s pub would probably help as well.